OK, it’s not quite Spring yet, but I am trying to be optimistic. I’m doing some events, and I would like you to come to them, because it seems no matter how many readings etc I undertake, I still get deathly afraid at every single one. So please come to some of these Things and make me feel better. Greenlight presents New Scotland: New Culture? “What is the role of culture in Scotland, now and in the future? What can politicians and the state do to support culture and the arts while guaranteeing creative freedom? So, those are some big and scary questions, and I have been given a 15 minute TED-talk-style slot in which to try and answer them. Except erm, instead I am going to go slightly off-piste and talk about my personal favourite cultural issue: diversity and inclusion. I might also read a poem or two. There will also be a bunch of other excellent speakers, who I imagine will stick to the brief a little better than me (sorry, everyone). There’ll also be music. And there’ll be Summerhall, which is always good. Please come along to this one, folks — my terror levels are significantly more elevated than usual for this event! Friday 21st February at The Counting House, 7.30pm. £5. I’m pretty sure you already all know what the literary juggernaut that is Rally and Broad is all about. If you don’t, I’d like to know exactly where you’ve been hiding. Basically, it’s a massive monthly night of literary and musical delights; a cabaret-style set up showcasing some of the best creative talent from across Scotland and beyond. And if you only know one thing about it, you’ll know it’s hosted by Jenny Linsday and Rachel McCrum. From what I’ve seen on Flickr, they each wear a different fabulous frock every month and always look rather nifty. I’m chuffed to have been asked to read at the February R&B, and I am already eyeing my wardrobe nervously, because what shall I wear?! More importantly, what shall I read, in order that I am not eclipsed by the very impressive humans appearing above me in the line-up?! Seriously, look at this — and then tell me you don’t want to be there. I’m pretty sure that’s the most EXCITING STUFF you can get for a fiver anywhere. Sunday 23rd February at Henderson’s at St John’s, 7.15pm doors. £5 / £3 concessions. OK, I am not performing at this one, but I will be floating around behind the scenes, supposedly helping out, but probably just being awkward and starstruck around the brilliant performers. This month, Shore Poets brings you the one-and-only William Letford, of whose work I am a major, major fangirl. Look him up on Youtube and see what I mean! 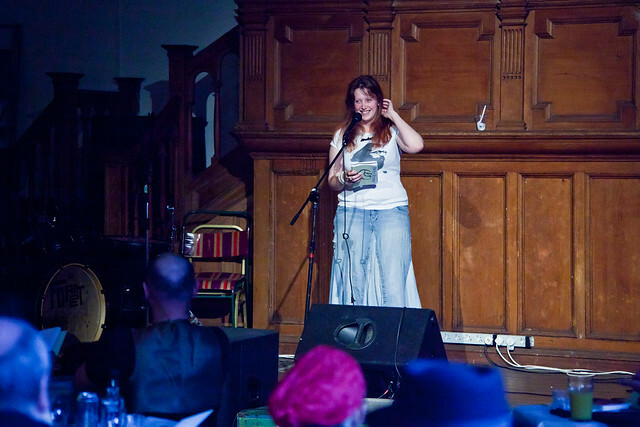 And Mr Letford is only the start of it… we have not one but two headline poets this month, honorary Shore Poet Diana Hendry, and honorary Shore Poets president Stewart Conn. Both have brand spanking new books either just out, or coming very soon, so come along to hear (I assume) some exciting new work! On top of all this, we’ll be presenting the annual Mark Ogle Memorial Award, which this year went to the excellent Meg Bateman. AND there’ll be live music from The Whole Shebang, as well as our infamous lemon cake raffle. YOU can also read at this event, by bringing a poem, putting your name in the hat at the door, and then, if your lucky, getting picked for one of our two wildcard slots. Yep, you. Come along already! Wednesday 2nd April at The Persevere Bar & Function Room, Leith, 7.30pm. £3. You are currently browsing the One Night Stanzas blog archives for February, 2014.